Digging for Gold at Gold Star | Cue Castanets! 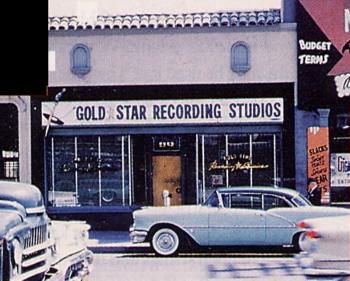 When investigating the Wall of Sound, at least the original source as heard on all those iconic Spector productions, you can’t underestimate the importance of legendary LA studio Gold Star. It was Spector’s favorite haunt and the place he returned to time and again to commit his ‘little symphonies for the kids’ to tape. With the aid of a veritable legion of incredibly talented session musicians, later dubbed the Wrecking Crew, Gold Star almost became Spector’s laboratory, his marathon sessions devoted to concoct the formula for perfect, supersonic impact – a sound so strong, so overpowering that it would charge through speakers everywhere, grab listeners by the shoulders and envelop them with otherworldly splendor. This segment makes for fascinating viewing. You get a sense of how crammed the studio really was during sessions. And although Sonny & Cher and some of the session men are obviously goofing around for the camera, you can sense the professionalism in the whole set-up. Sonny Bono was of course no stranger to either Gold Star or the Wall of Sound, having previously served as a gofer, percussionist and sometime back-up singer on numerous Spector sessions. When he found success with his girlfriend Cher, he did so by making the most of his first-hand knowledge of Spector’s recording methods. More about that in a later installment of ‘Would-be Spectors’ for this blog. Session at Gold Star. Phil (left) looks for someone who can join Sonny Bono (right) on sleigh bells. Enjoy the clip if you haven’t seen it already and then do yourself a favor and head over to the Classic Studio Sessions blog. The blog seems to be dead now, but from 2010 up until last year it featured some interesting research carried out by Josh Hoisington and Craig Clemens. In their very first blog post back in 2010, Craig took his point of departure in this short clip and wrote a very detailed walk-through, pinpointing the recording set-up, some of the gear used and, perhaps most interestingly, identifying most of the session players. It’s a beautifully written and very insightful piece – perhaps a bit on the technical side for some but if you have any interest in the 1960s LA studio scene, it is a very worthwhile read. Previous PostSpoon – You Got Yr. Cherry Bomb (2007)Next PostThe End of an Era? 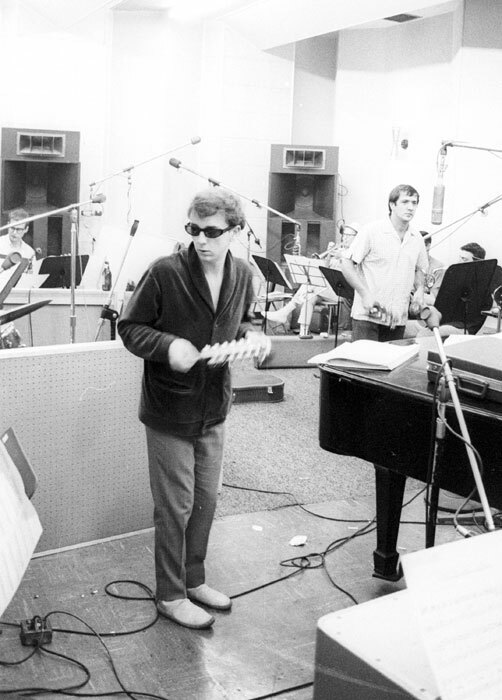 Pingback: Guest Post – “Phil Spector and Brian Wilson” | Cue Castanets!